Sightseeing-tour near Frankfurt Airport, Darmstadt to 70 Castles, Fortresses, Ruins, Palaces, Towers and Historical Hotel Restaurant on the Romantic Castle Road. Part 6: Bayreuth, Karlovy Vary und Prague. Relax by visiting the middle aged german Castles and Towers Hotels and Restaurants on the Castles Road in Germany. Take a moment for a romantic cruise to the picturesque german Villages, Castles and well known Vineyards on the Neckar, in the Black forest, in South and South West Germany. 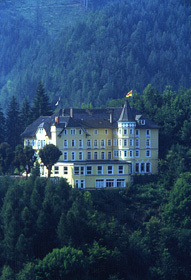 Castle Hotels in Germany: in Southern Germany, West Germany, East Germany and North Germany, request more information on 100 various german castle Hotels via 3 different forms. Planning a Rhine river cruise and want to see the most castles along the Rhine in one or two days? The 781-hors castle hotel Black Forest lies in the middle of the Black Forest, quite exactly in the middle of the towns Offenburg (about 46 km north west), Freudenstadt (about 50 km north east), Freiburg in the Breisgau (about 48 km south west), Titisee-Neustadt (about 50 km south) and Donaueschingen (about 48 km south east). It's surrounded by a big park, the medieval castle ruin and a playground for children. With its stylish outfitted hotel rooms, lounges and dining rooms, it offers the ideal requirements for a relaxing stay in the Black Forest, for festivities of all kind and successful meetings.